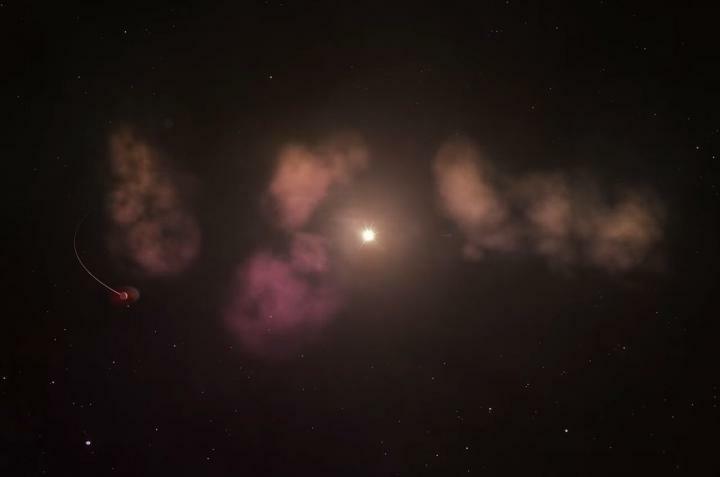 A team of U.S. astronomers including UCLA's Benjamin Zuckerman has found evidence suggesting that the strange, unpredictable dimming of a star 550 light-years away may be caused by vast orbiting clouds of gas and dust. The star, RZ Piscium, is in the constellation Pisces, and the huge dust clouds appear to be the remains of one or more destroyed planets. During the erratic dimming episodes, which can last as long as two days, the star becomes as much as one-tenth as bright. A paper detailing the findings is published today in the Astronomical Journal. The star is young — between 30 million and 50 million years old, the astronomers estimate. But typically, the dust from the star's youth would have dispersed after a few million years, so scientists did not expect that a star that "old" would be surrounded by so much gas and dust. "I've been studying young stars near Earth for 20 years and I've never seen anything like this one," said Zuckerman, a professor of astronomy. "Most sun-like stars have lost their planet-forming disks within a few million years of their birth. The fact that RZ Piscium hosts so much gas and dust after tens of millions of years means it's probably destroying, rather than building, planets." The scientists determined that RZ Piscium is surrounded by a disk of warm dust because the star produces far more energy at infrared wavelengths than stars like our sun. About 8 percent of its total luminosity is in the infrared, a level matched by only a few of the thousands of nearby stars scientists have studied over the past 40 years. "Our observations show there are massive blobs of dust and gas that occasionally block the star's light and are probably spiraling into it," said Kristina Punzi, a doctoral student at the Rochester Institute of Technology and the study's lead author. The astronomers determined that the star's surface temperature is about 9,600 degrees Fahrenheit (5,300 degrees Celsius), only slightly cooler than our sun's. They gauged the star's age based on the amount of lithium they detected on the star's surface — a good guide because the amount of lithium declines as stars age, according to Joel Kastner, director of RIT's Laboratory for Multiwavelength Astrophysics and the study's co-author. According to the paper, the data indicates that the debris surrounding the star represents the aftermath of a disaster of planetary proportions. It's possible that the star's tides are stripping material from a close companion — likely a brown dwarf or giant planet — which is producing intermittent streams of gas and dust, or that the companion is already completely dissolved. Another possibility is that one or more massive gas-rich planets in the system underwent a catastrophic collision in the astronomically recent past. The team conducted its research using the European Space Agency's XMM-Newton satellite, the Shane 3-meter telescope at Lick Observatory in California and the 10-meter Keck I telescope at W. M. Keck Observatory in Hawaii. In addition to the astronomers from UCLA and RIT, the team comprised scientists from UC San Diego and Indiana University. Ground-based observations also probed the star's environment, capturing evidence that the dust is accompanied by substantial amounts of gas. Based on the temperature of the dust, around 450 degrees Fahrenheit (230 degrees Celsius), the researchers think that most of the debris is orbiting about 30 million miles from the star.